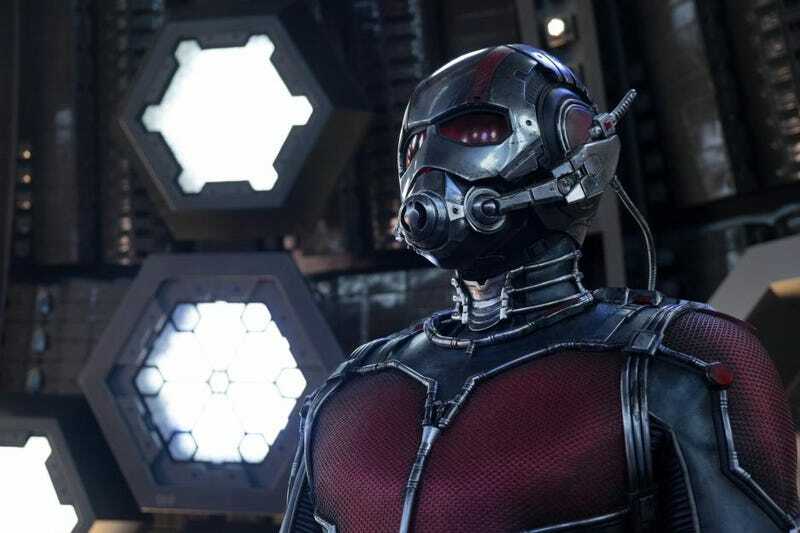 Now that Ant-Man is in theaters, it’s time to fully discuss some of the bigger spoilers in the film. These involve Avengers, upcoming Marvel characters, new movies, past movies and more. Some you noticed, some maybe you didn’t, but we got the head of the studio, Kevin Feige, and director Peyton Reed to explain their implications and how it all came about. Major spoilers follow, of course. At the end of the film as Falcon (more on him in a bit) talks with a journalist. The journalist mentions there are superheroes that swing and crawl up walls, a seemingly obvious nod to Spider-Man now that the character is joining the Marvel Cinematic Universe. And while this line of dialogue is now our first MCU mention of Spider-Man, that was not the original intention. The Falcon scene, in which Ant-Man battles the Avenger, is a key scene not only in the film, but in the Marvel Cinematic Universe. It was conceived by co-writer Adam McKay with effects by Industrial Light and Magic, but there’s much more to it. First of all, the scene necessitated changes in Avengers: Age of Ultron. Then there’s the Avengers facility itself. Speaking of freeze frames, Reed teased that Janet Van Dyne may have a secret scene in Ant-Man. In the film, we see her as the Wasp just before she disappears into the Quantum Realm then again in a photo. But Scott Lang too goes into the Quantum Realm . “I don’t know if you caught any of the imagery as Scott is going down into the quantum realm, you might be able, on repeat viewing and definitely when you get the Blu-ray, there’s something the audience can see down there that Scott doesn’t see, that, may play a larger role,” Reed said. Does he mean Janet? Maybe, or maybe it’s something else. The Wasp tag scene, where Evangeline Lilly’s Hope Van Dyne is finally given the new Wasp costume by Hank Pym, was originally before the credits. It was then moved back because it was such an important moment. As for when we’ll see the character in action, it won’t be too soon. Feige said it deserved more than just a cameo in Ant-Man or Civil War. Think Ant-Man 2, if it happens, or possibly Avengers: Infinity War. Lilly is signed for a multi-picture deal. Finally, we previously revealed that that the final end credits scene was lifted from dailies the Russo Brothers shot for Captain America: Civil War. In the scene, Captain America and Falcon have the Winter Soldier captured and discuss their plan will be better with another person. The implication? Ant-Man. But what exactly is going on in the scene? “What you’re looking at there is a giant vice that [The Winter Soldier’s] metal arm has been purposefully trapped in,” Feige said. That’s all he’d say but the scene comes from during the movie so we’ll learn how Falcon and Cap capture the villain of The Winter Solider when Civil War is released in May 2016.